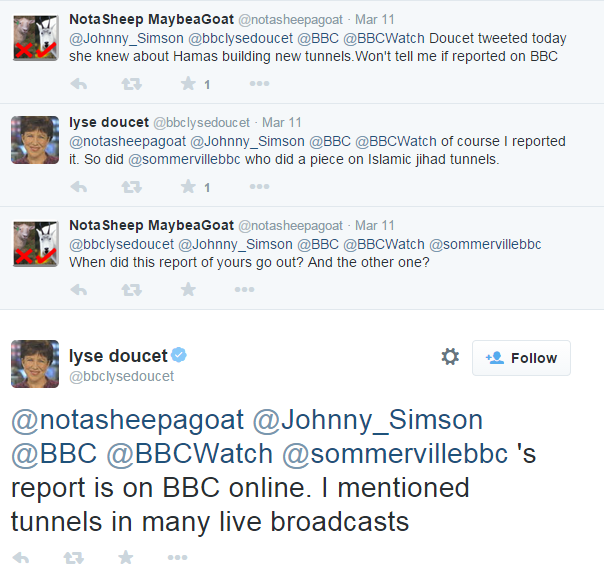 The BBC’s chief international correspondent Lyse Doucet recently engaged in a Twitter conversation on the subject of her organisation’s reporting of the topic of Hamas’ cross-border tunnels. Some threads from that conversation can be seen here, here and here but readers will get the gist from the screenshot below. Quentin Sommerville’s two reports (previously discussed here) actually related more to the subject of PIJ rearmament than to the reconstruction of tunnels. As for Doucet’s claim that she “mentioned tunnels in many live broadcasts” – that is true as long as one sticks to the dictionary definition of the word ‘mention‘. As we noted here previously, Doucet displayed “no interest whatsoever in questioning Hamad about where the money and materials for rehabilitation of Hamas’ military capabilities are coming from”. So yes: Doucet did “mention” tunnels. She did not, however, present BBC audiences with the comprehensive picture of the threat those tunnels posed to Israeli civilians in the summer of 2014 which would have enhanced their understanding of the actions taken by Israel and the scenes Doucet now reports with so much pathos. Given that most of the reporting produced by Doucet and her colleagues on that subject whilst the conflict was ongoing was similarly lacking – see examples here, here and here – that omission is obviously very significant. But no: Doucet did not provide BBC audiences with anything which can seriously be described as meaningful reporting on Hamas’ reconstruction of tunnels since the end of the conflict in any of her many recent reports (see related articles below) from the Gaza Strip. Typical one-sided BBC reporting – what else do we expect from them. But nobody seems to do anything about it. She mentions “Islamic Jihad” but the BBC still refuses to describe them as terrorists or “Jihadists”! BBCWatch doesn’t like the BBC because it is an honest news outlet. I see that you are scraping the barrel by cataloging things that you think are in your favour but she doesn’t mention, she is just being factual. I suppose you expect her to push your rhetoric for you. Doucet proclaimed in sombre and accusing tones last summer, ‘but there are no military targets on this beach’, even as the police hut on the breakwater known by locals and journalists to be used by hamas operatives smouldered behind her. Dozens of journalists were willingly complicit in the fiction presented that day, but it’s still depressing as someone who grew up unquestioningly accepting the BBC as fundamentally decent and honest just how utterly rotten and malign its news arm is, and the shamelessness of Bowen, Doucet, Guerin, Donnison, Knell and on and on. Well, I suppose peddling Israeli propaganda keeps you in a job. Starts at 7:30 minutes in. I too used to believe that “the BBC doesn’t always tell you all the truth, but what it does tell you is true”. Not now. I even signed a petition against Thatcher’s plan to abolish the World service. What’s depressing is how readily sincere, well-meaning, normal people swallow and regurgitate the lies of these hamas spokes-people, and how completely Bowen and pals have discredited the BBC as a news broadcaster. Doucet, donnison & guerin know they’re liars but they believe their cause is moral and it exonerates them. The useful idiots for the most part can’t imagine that the BBC would lie to them, and the fantasy it presents becomes their reality. Between Bowen and Netanyahu … I’d trust Bowen. Netanyahu is not a BBC journalist. Chalk and cheese. I’m sure Bowen would thank you for that. Bowen is not a “journalist” either, he’s a propagandist, neither is he the elected leader of a country. He’s a nobody. Bowen IS a journalist, a good one at that. Hamas are the elected leaders of Gaza …. unfortunately when that occured Israel and the US didn’t like that democratic decision, so put the shackles on Gaza. Re. Mr Bowen .. he obviously is NOT a nobody … he’s got your attention! How long was Hamas elected for? When will the next elections take place in Gaza? How does it feel to defend an internationally recognised terrorist group whose charter calls for the destruction of Israel and the murder of Jews wherever they may be found? I do not support the killing of civilians, either by Hamas nor Israel. Destruction of Israel. We both know that will not come about through military means. Doesn’t Bibi deny the creation of a Palestinian state? Same thing. When will the next elections take place in Gaza (or the PA)? I.don’t know when the next elections will take place, sorry. I don’t support Hamas methods but do expect their actions whilst occupied. It’s plight of the Gazans under Israeli grip that I find disgusting. Think it’s time for the world to impose sanctions on the country that thinks it’s ok to steal land and abuse the population. That say you’d trust a man who claims he saw no evidence of hamas using human shields, even after more honest reporters than him have broadcast video of them doing just that (http://m.ndtv.com/world-news/ndtv-exclusive-how-hamas-assembles-and-fires-rockets-641680), and after they themselves have repeatedly boasted of doing just that (http://elderofziyon.blogspot.co.uk/2014/07/hamas-encourages-human-shields.html?m=1), who regularly promotes the racist BDS campaign to demonise a state based on the ethnicity of its inhabitants and whose own employer has had to admit his bias (http://netwmd.com/blog/2009/04/17/3937, https://bbcwatch.org/tag/balen-report/) tells me either a) you’re ignorant, or b) you share Bowen’s prejudice and shamelesslness about it. Video 1 … yes, they fire rockets from near buildings. It behoves Israel to seek these positions out …. not cowardly flatten the area from F-16s knowing that there are civilians in that area. Video 2 …. given that Israel bombs civilian buildings if it is suspected that a Hamas leader/fighter is resident with little or NO warning people will try to persuade the occupiers from destroying their only home and their possessions. How dare Israel destroy the homes of families just because they occupy the land. Video 3 … shall watch after breakfast. Bowen’s points 1 and 2 are spot on. Israel has followed Ben Gurion’s methods., Israel (with the tacit support and generous subsidy of/from the US) does ignore Int. Law…… as for the feelings of the Generals, I wouldn’t know. The IDF does not ‘cowardly flatten the area from F16s’. They take greater measures to avoid civilian casualties than any other army in human history. You’re living in a childish, racist fantasy. Hamas deliberately firing rockets from amongst civilian buildings is a war crime, explicitly intended to kill their own people so morons will then condemn israel for defending itself. Bowen’s belief that Israelis – or jewish Israelis specifically – have an innate desire to conquer territory and that they have no regard for international law is profoundly racist and echoes long-standing anti-semitic lies. It’s also contradicted by every observable fact and repeated offers of land for peace – all rejected by the genocidal racist scum who will accept nothing less than the annihilation of the jewish state. ‘[Colonel Richard] Kemp testified before the United Nations Fact Finding Mission on the Gaza Conflict, denying allegations that Israel engaged in war crimes and crimes against humanity during the Gaza War in December 2008 to January 2009. Kemp based his assessment on publicly available information from both sides, press reports and his 30-year experience of counter-terrorism operations and planning. In June 2009, Kemp wrote “HAMAS, THE GAZA WAR AND ACCOUNTABILITY UNDER INTERNATIONAL LAW” for the Jerusalem Center for Public Affairs. In this paper, Kemp accused Hamas of deploying women and children as suicide attackers, and wrote that “women and children are trained and equipped to fight, collect intelligence and ferry arms and ammunition between battles”. In October 2009, Kemp made a presentation to the United Nations Human Rights Council in response to the introduction of the Goldstone report in which Israel and Hamas were accused of war crimes and possible crimes against humanity during the Gaza War. Kemp spoke to the UN HRC on behalf of UN Watch. Kemp said: “Of course innocent civilians were killed. War is chaos and full of mistakes. There have been mistakes by the British, American and other forces in Afghanistan and in Iraq, many of which can be put down to human error. But mistakes are not war crimes…Based on my knowledge and experience, I can say this: during Operation Cast Lead, the Israeli Defense Forces did more to safeguard the rights of civilians in the combat zones than any other army in the history of warfare”. Excellent submission to the UN by Kemp, bio. ” racist fantasy” .. what have I said that is racist? I know where my money comes from … I do not know where Richard Kemp’s money comes from! The fantasy that the IDF wantonly or callously kill civilians when the exact opposite is true. And you’re doing it again by implying that Richard Kemp is being paid by Israel. That’s not sincere stupidity on your part: you’re a sly, lying racist propagating anti-semitic tropes. Troll somewhere else, scumbag. Does Richard Kemp receive any money from Israel or Jewish interests? Does the BBC receive money from Arab countries and interests? The answer to that is a resounding YES. By the way, are “Israel or Jewish interests” different to you, or are you an equal opportunity Jew hater? “Does the BBC receive money from Arab countries and interests? That’s completely wrong. It receives money from the licence, local authorities and £3 million from the EU. ” are “Israel or Jewish interests” different to you?” Of course. It isn’t a Jewish state. It’s a state where the majority are Jewish. Doucet was horrendous on the World Service during that war, simply echoing Hamas propaganda. Perhaps she (along with the rest of the motley crew pretending to report on the conflict) feels less constrained on the World Service than on BBC TV or the BBC ‘News’ Website. The World Service has the greatest range worldwide since there are no restrictions on it online and there is also that old fashioned thing with an aerial called a radio. As such it’s a propagandist’s dream.